W.J. 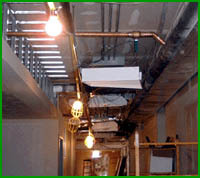 & R. Electrical, Inc. provides residential, commercial, industrial & institutional electrical construction & design services. W. J. & R. Electrical Design Contractors offer electrical design & construction for your plan/ spec building needs. We work with your architects & engineers. We also provide complete design/build services to take you from initial concept to completion of your project. In 2013, we have added residential projects to our portfolio. We have taken this opportunity to update our website, while adding information about our residential services. W.J. & R. Electrical, Inc.
We provide design & installations services for the following: Residential, commercial, industrial & institutional electrical construction & design services. W.J. & R. Electrical, Inc. is conveniently located in Northampton County, Lehigh Valley, just north of Allentown, PA.